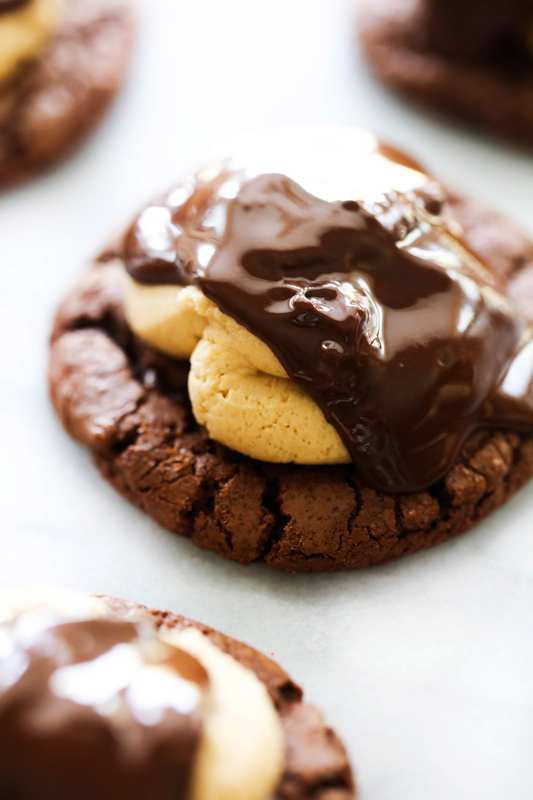 These Buckeye Cookies have a soft and chewy chocolate cookie base. They are then topped with a delicious creamy peanut butter filling and then a chocolate ganache is poured over top. These cookies are rich and delicious. They are sure to be any peanut butter/chocolate lover's new favorite cookie! In a small mixing bowl, combine peanut butter and butter. Beat on high until creamy. Add powder sugar and milk. Beat again until well blended. Spoon mixture into one corner of the baggy. Cut of ½ inch of one of the corners. Pipe peanut butter mixture over each cookie. In a glass bowl combine chocolate chips and shortening. Microwave on high for 1 minute. Stir. Microwave again for 30 second increments, stirring between each increment, until the chocolate is melted. Spoon chocolate over each cookie.